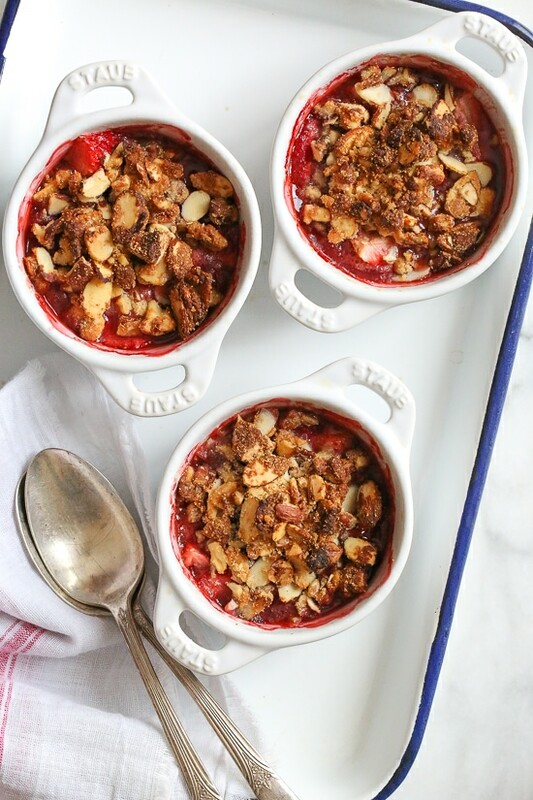 These individual gluten-free strawberry crisps are topped with a crisp nutty topping using a combination of almonds, walnuts and pecans. 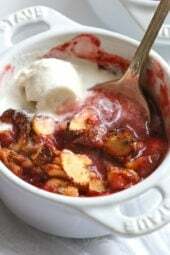 I wanted to make a fruit crisp topped with nothing but nuts – no oats, no wheat flour, letting the flavors and texture of the nuts really stand out. The results were pure deliciousness! You may also like Cinnamon Apple Crisp, Blueberry Peach Crisp or Triple Berry Crisp. I lightly sweetened the strawberries and nuts with honey, and (totally optional) added a heaping tablespoon of frozen yogurt on top for that hold/cold combination I just love! 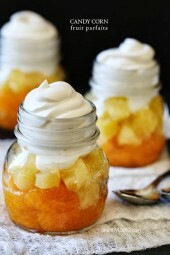 A dollop of whipped cream or coconut cream would also be delish on top! Making them in individual ramekins is my favorite way to keep portions in check. You could also make this in an 8 x 8 baking dish if you wish. 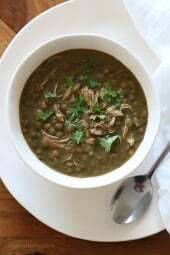 For less servings, this recipe can easily be halved. Swap the strawberries for blueberries or make a combination of berries. You will need 5 cups of fruit total. How can you make without remakins? It looks so good but I don’t have any! Can this be frozen? I just made a big double batch with the atrawberries we picked over Memorial Day weekend. Delicious! Will make again! The whole family loved it. Delicious recipe! I made it in a casserole dish instead of ramekins. It less sweet than the traditional crisp but it’s not missed! I served with golden vanilla ice cream while it was warm and it was very good! Made in small (9×9? ) casserole dish. The topping was incredible and would be great as a standalone snack. I used all purpose flour in place of almond flour. Not sure what went wrong with the strawberry filling though. It came out really runny, so maybe I needed more cornstarch to help thicken it. The strawberries themselves were really pale and tasted a bit odd. I may try again with apples and throw in some cinnamon, nutmeg, and sub OJ with vanilla next time. Wondering about success with frozen berries too ! You might have to add more sugar as they aren’t as sweet and tasty. I’d love to know if anyone was successful with frozen berries! This sounds so good! 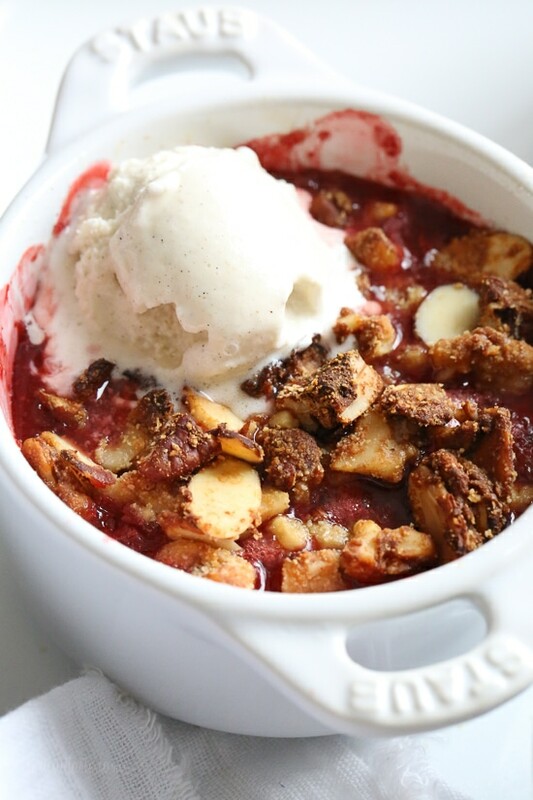 Love the nut crumble on top! Can frozen berries be used instead of fresh? Are you looking under the ingredients? It shows on mine. I want to make this for family gathering on Saturday. What size casserole dish would I use in place of using the ramekins? how may i print this? it looks great and has all the ingredients we like. Print button next to the ingredients. I left this as a question on your Facebook post, but I fear it might get lost. Corn starch is part of the “kitniyot,” and is not Kosher for Passover in all homes. Would potato starch (or even matzah meal) be an acceptable substitution? I love your ramekins! Where did you get them? 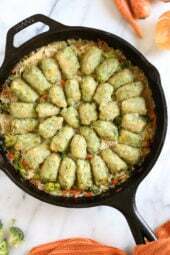 I have smaller round ones and need larger ones to make this recipe for Easter.! Can’t wait! It looks sooo delicious! 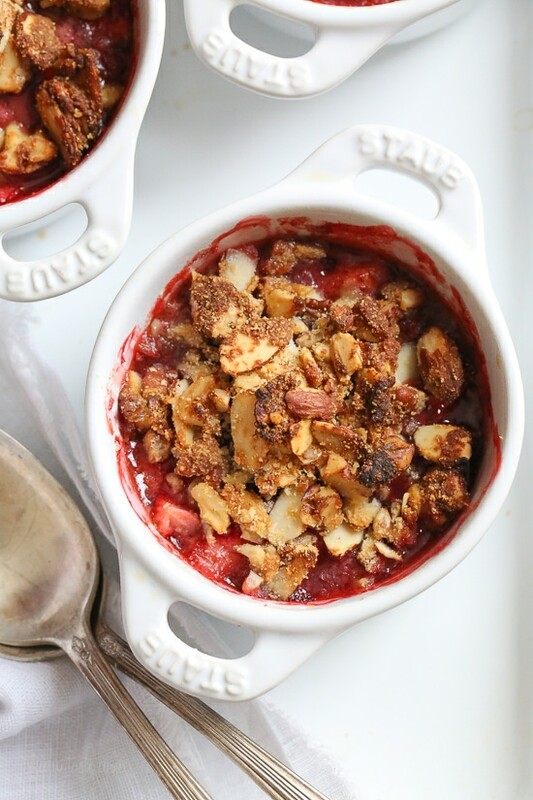 If I wanted to add some rhubarb to this how should I adjust the mix between the strawberries and rhubarb and should I increase the honey and orange juice based on the bitterness of rhubarb? Just made this with the fruit and juice I had on hand- 4 c strawberries and 1 c blueberries and used pineapple juice in an 8×8 pan and it turned out amazing! Thanks for the email link!! They look super yummy! Love your ramekins too! I wonder if you could use diet orange soda instead of orange juice to save points? I would say no. It will not impart the same flavor….and you would only save maybe two calories a serving. This is a wonderful recipe. Because we have black raspberry bushes I substituted them for the strawberries. Later I will try it with different berries or a combination. It’s definitely a keeper!Thank you so much for all your recipes. 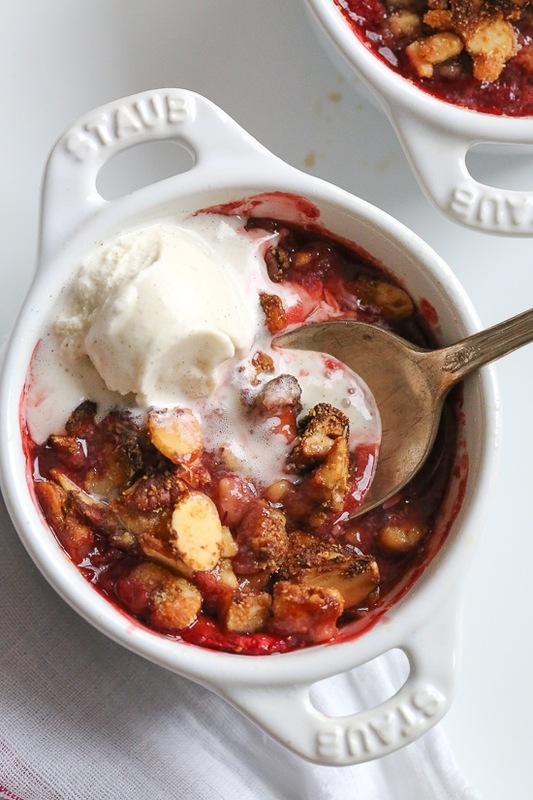 Could you use frozen fruit for this? I made this today. I did Blueberries, Strawberries and Raspberries since Gina said we could. I stay with the 5 cups. This is flipping awesome!!!!! The topping was so good! amazing desert. YUMMM, perfect for dessert tonight. Could any type of flour be used in place of the almond flour? Whole Wheat or White Whole Wheat for example? This sounds delicious. Will you clarify the serving size please? You call for four ramekins, say the recipe makes eight servings, and say one serving size is one crisp. I am unclear how the nutrition information relates to this. Thank you. its 8, 4 oz ramekins. Serving is 1.